Know the limitations so they can work in your favor. During brewing, from start to finish, the temperature at the screen and within the coffee puck is not constant; it is more of an average temperature. There are many factors which dictate the effect of temperature on the coffee, such as, time, length of contact with coffee and thermal conduction between the coffee and water. In addition, water temperature will always vary as it travels through the puck, coming in contact with the coffee and losing heat as it passes to the cup; a slightly different extraction profile will be created for coffee at various depths within the puck. Using a single number for the ideal brewing temperature really doesn’t provide accuracy unless you are talking about a particular grind and size of puck (density and thickness) and the effect the moving water that starts at a certain temperature has on the coffee in that particular puck. So I strongly recommend, first getting consistency with grind and tamp for a particular coffee and then letting brewing results and taste dictate the set value temperature of the boiler. As you will find out, the most likely cause of a bitter, harsh and astringent taste is an extraction that is uneven and/or an extraction time that is too long, not slight variations in temperature of the boiler. With Silvia, when you have an optimally uniform extraction, even a 5 or 10 degree variation in temperature at the boiler will not produce a bitter, harsh taste). Water pressure delivery: Unlike commercial machines or home machines with the E61 group head, Silvia has no water flow control or restrictions in water flow and no ability to regulate water flow. Also, because of this specific boiler design there could be a variation in the amount of air in the boiler every time we brew. This variation will affect the extraction as described below. Therefore in order to achieve consistency in the extraction, you have to be a extra careful as to how you are dosing the portafilter basket and how you operate the machine (in a home setup, you should have the extra time to deal with these issues that commercial baristas do not have but which are less relevant in the machines they use). Pre-soaking or pre-infusing the grinds will not be a magical fix for all errors in dosing and extraction. So do not attribute your success or failure in good extraction to pre-infusion. In dosing the basket you have two options, dosing and firm tamping or dosing with no tamping or light tamping and these options are discussed below. 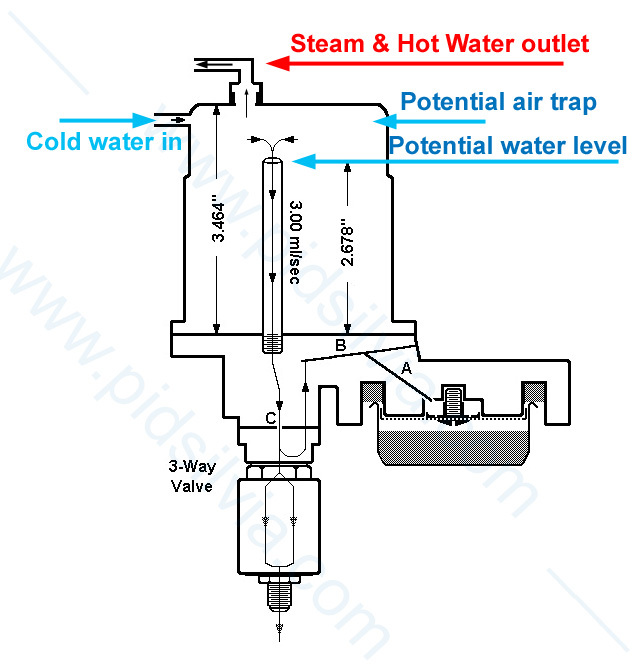 In operating Silvia, we can have a full boiler with no air or some air, or even a dried out boiler, see diagram below. Because of this specific boiler design we could have some amount of air trapped at the top of the boiler. This air acts as a dampener or cushion for the force coming from the pump. Furthermore, this specific boiler design makes it more likely that there will be a variation in the amount of air in the boiler every time we brew. If you leave the steam valve open, you might even find that the boiler is dry. When you tamp, you are creating a highly compressed, constrained mass of coffee--the “puck”. As a result, any errors in distribution are locked into the puck. Errors in the grind or distribution which might be reduced through soaking of the ground coffee (pre-infusion) which was softly tamped are locked into place with the firm tamp as the pressure on the puck is increased, worsening the result. Still, if you are able to dose and compress a perfect puck, it is like the skill necessary to place a big heavy rock on a glass table without cracking the glass. If you can do it people will consider it a real achievement. With coffee, the skill of creating a good puck will show in the taste. With little or no tamping there will be more tolerance for small errors in distribution (seams/cracks) or in the amount of the coffee used to dose the basket. You still have to start with a decently uniform grind distribution, but if you made any slight errors in height or distribution, the force of the expanding or swelling coffee will tend to fill the voids much better than if the coffee has been tamped into a rock-hard puck. With no tamping, the puck is soft and is better able to receive or accommodate to the pressure from the screen and water above. Note: If you tamp, you must do it right and know the positive and the possible negative effects of a bad tamp. If you are new to espresso or have no good experience with tamping, I strongly recommend you use the no tamping (soft tamping) option. And even if you know what you are doing, it is not clear that the hard tamp produces any better result.